The old, perhaps toothless saw, that the novelist is not necessarily a good critic any more than the drunk is a good bartender is certainly disproved by three contemporary cases--Sheed, Leonard and especially John Updike who is a reviewer of extraordinary grace, clarity, amiability and of course humor. This collection (more predominantly than his Assorted Prose--1965) consists primarily of his reviews for The New Yorker along with a few of those "assorted" other pieces on meeting writers (Joyce Cary, "a well-knit sandy man," or Thurber and Borges--"blindness and fame and years do island a man"); on the novel in general and writing in particular ("Why write? As soon ask, why rivet? "), a parody or so, etc. Almost never does he indulge in some of the "tendrilous" ornamentation occasionally found in his own novels. The reviews, necessarily, are important or just diverting according to the books in question. Great people bring out the best in Updike and here the pieces make lasting commentaries: Proust's Remembrance of Things Past--which he considers the finest novel for all time--"is, like the Bible, a work of consolation": there are fine discussions of Dostoyevsky, Joyce, the more circumscribed Borges who "reduces everything to a condition of mystery," Nabokov (several reviews), the "best-equipped" writer in the English-speaking world even if Updike found Ada's "nulliverse" as irritating and distracting as we did; and he resists that demanding "superb tyrant" Ivy Compton-Burnett. And in Messed-Up Life, the T. S. Matthews biography of T. S. Eliot, Updike returns Eliot, denigrated here, venerated there, to the immanent power of his work--"a steady force of seriousness, of caustic austerity, engraves [the poetry] on our minds." Updike, as a critic, represents the wisdom of that bon sens populaire--he's never taken in by donnish side (a la Murdoch) or the artifice of all those novelty novelists who recur as theoreticians in disguise. 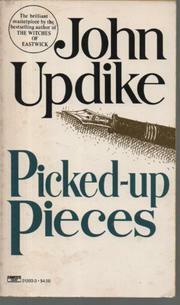 Updike is a Renaissance man of many talents and seasons, reflecting the values which reach us--reality, civilized pleasure, and those recognitions which enlarge the written word.